Yagul (literally “old stick” or “old tree”) was first settled at the beginning of Monte Alban Period 1 (500 BC) and flourished as an urban center until the demise and abandonment of Monte Alban (800 AD) when Yagul was abandoned as well (though only for a short period). As Monte Alban was the capital of Zapotecan rule over the region, the rise and abandonment of these cities at approximately the same time may very well have a connection. 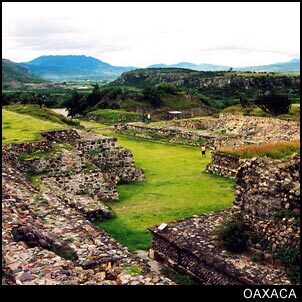 Yagul then reemerged as a thriving city during Mixtec rule over the region from Mitla, and was not abandoned until the Spanish forcibly moved the population out of the fortified city and down the hill to the modern city of Tlacolula. The city of Yagul was designed with militarily strategic fortifications. In the center lies an enormous man-made platform with staircases which lead up to the temples and main palace. Steps then lead up the hill on the north side of the city to the acropolis with its defensive walls and watchtower which overlooks both the city and the whole Tlacolula Valley. The vast majority of the city's population lived on the hill behind the fortifications. Such preparations would lead one to believe that the city may have been designated a military stronghold by the Zapotecans who ruled the region from Monte Alban. Whatever the cause, this city was intentionally founded in a place that would incorporate the natural terrain into a defensive stronghold. They wouldn't have gone through all of that trouble without an enemy out there somewhere. The Triple Tomb is shaped like a “T” with tomb 3 on the east, 29 on the south, and 30 on the north. The entrance is located in Patio 4. 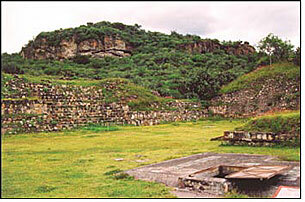 The triple tomb was excavated in 1954, and was found to have been looted in prehispanic times. It is, however, an example of the funerary architecture of Yagul. The tomb has a roof made of large flat stones and is decorated with frets in relief with its facade and doorway being similar to those found at Mitla and Xagaa. The Photo (above left) shows the Acropolis (top of picture) and the entrance to the Triple Tomb (bottom right of picture). The Palace of the Six Patios is almost identical to the Group of Columns at Mitla, and was probably the home of Yagul’s ruler as suggested by the size and throne found in the northwestern patio of the southern room. The Palace (made of stone and stucco) resides on the highest platform in the city with steps behind the complex leading up to the acropolis. The location of the ball court between the Palace of Six Patios and Patio Four, and the fact that its size is second only to Chichen Itza in Mesoamerica, are evidence that the ball games held in Yagul were as important as any major sporting event we have today. In fact, some archaeologists believe that glyphs with priest figures making offerings with calendar dates could have a cyclical ritual significance. To get to the ruins at Yagul you will need to go to the Second Class Buss Station and get on a bus headed towards Mitla (12 Pesos each way). Just tell the driver to let you know when you reach the stop for Yagul and he will drop you off in the right place. Then follow the sign pointing towards yagul and walk about a mile down the road. The ruins are open Tuesday through Sunday from 9-5. Entrance to the ruins is 30 Pesos (free on Sundays for Mexican Nationals only). The charge for a video camera is 30 Pesos, but tripods are by special permit only. Guides are available for 120 Pesos.